Greetings fellow aliens (what planet are we on again? ), whoops, I meant Earthlings. Welcome to my first attempt at a home page, and eventually it will get better (I hope). I am a student at Monash University, Caulfield Campus, where I am studying computing full time for 3 years. Let me Predict Your Future. Here is an interesting animation file of a candle! Here is a picture of a compass, which you can get to play on demand! You will find a lot of trivial sporting anecdotes, due to my passion for all sporting events (especially Anna Kournikova playing tennis!). I have followed them since I was about 5yrs old. I have been following their performances since then and I am finally glad to see them having success. After all they have only won the one premiership since they joined the league in 1925. The success coming in 1954. The Bulldogs who were known as Footscray up till the end of 1996, are now called the Western Bulldogs. The AFL is the national football competition in Australia, and it stands for "Australian Football League". This was the result of the revamping of the old "Victorian Football League" (VFL). The competition holds 16 teams from around Australia battling it out to win the premiership. You can gather more information on the AFL by visiting their web site. The team I would like to win the NBA championship is the Seattle SuperSonics. Chris Anstey was drafted in 1997. The SuperSonics have had the best overall record in the last five years, including being the Pacific Divison champions for the last three years, but have not captured the elusive NBA Title. With the huge three team trade at the end of the 1997 finals, the Sonics were looking to rebuild their team with the youth of Vin Baker. In 1999, the Sonics missed out on the playoffs for the first time in many seasons, you now wonder if management is wondering why they sacked George Karl! Although I must admit, Paul Westphal is a good coach, and I'm sure given a full season next year should do better. Especially if the injuries stay to a minimum. But only time will tell. The addition of Brent Barry and Horace Grant should add talent and with a good mix of youth and experience, I think moves that have made the Sonics a better team. To find out up to date infromation from the NBA for any team, just visit their web site. Now to the Australian league, where I used to follow the South East Melbourne Magic. The Magic were born at the end of 1991 when the Eastside Melbourne Spectors and Southern Melbourne Saints merged. The Magic of course have won two NBL Titles, in 1992 and 1996. And last two years they finished runners up, firstly to their rivals the Melbourne Tigers and then to Adelaide 36ers. At the end of 1998 the Magic and the North Melbourne Giants merged, to form the new Victoria Titans who will play their first season in this first summer season in 1998/1999. At the moment I am still deciding whether or not to follow hte new merged team. But the Titans should just about be an unstoppable force in the next few years with the talent available. But the runners-up result to Adelaide is sure to be unexceptable, and changes are almost certain. I love watching the Aussies play cricket in the summer, especially when I go to the MCG and watch them play live. I don't know if they warrent the title of world champions, not just yet anyway. My favorite player in the Australian team would have to be Shane Warne, because he is a Victorian of course! I also enjoy watching the talented Mark Waugh when he bats. If you would like to know about upcoming tours and the lastest news, or any stats that you may want to know, visit the official ACB homepage. Although in Europe this is known as Football. I myself have no interest in the local Australian League, the NSL, but I do like watching the FA Premier League. There I follow Arsenal, otherwise known as the Gunners. Of course everyone knows that in 1998, they managed to win the elusive double, which of course is the Premier League Title and FA Cup (beating Newcastle Utd 2-0). My favorite players are Dennis Bergkamp and Marc Overmars. I did like Ian Wright before he was moved to West Ham United. If you are more of a soccer lover than me and you want to read about the long and wonderful history of Arsenal Football Club, just go here. 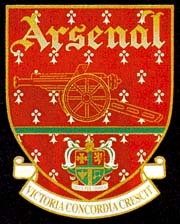 To find out a lot of did you know about Arsenal, visit this site. For a more informative look at the whole of the Arsenal Club this site would be better for you. The best site to visit is ArseWeb. This is much better than that Union crap! I have very little knowledge of the game, but enjoy watching it on the television at times. My favorite team is the local boys Melbourne Storm, (but for the record I went for the Brisbane Broncos before Melbourne came along) after all who else? It is great to see them winning and I hope it continues into the future, well into the future. An unfortunate loss to Brisbane in the finals saw the end to the Storm's first season, which is sure to have gained a lot of people's respect after getting that far. If you want to email me with your comments, click here. Thanks to Jason for his assistance in creating this page. This page was last on the 21/07/2002. This is your visitor number since 28/05/1999.